Here we go again, ....humiiiiiiin?!!? My bowl is empty!!!! If we really have an "Again" situation here, Leonardo is soon going to be calling out to his new, replacement human. It is a shame, because the current human has done some nice work with color in the bunn habitat. May have been the one before that what did the color scheme. That "AGAIN" sounded like something that has happened more than once or twice. The current hoomin may have been eating Snickers when the bowl fillin' time was at hand. That is why Snickers in the Tar Pits is not allowed. Sorry to hear about the Snickers, but I guess sometimes you have to look at the big picture. 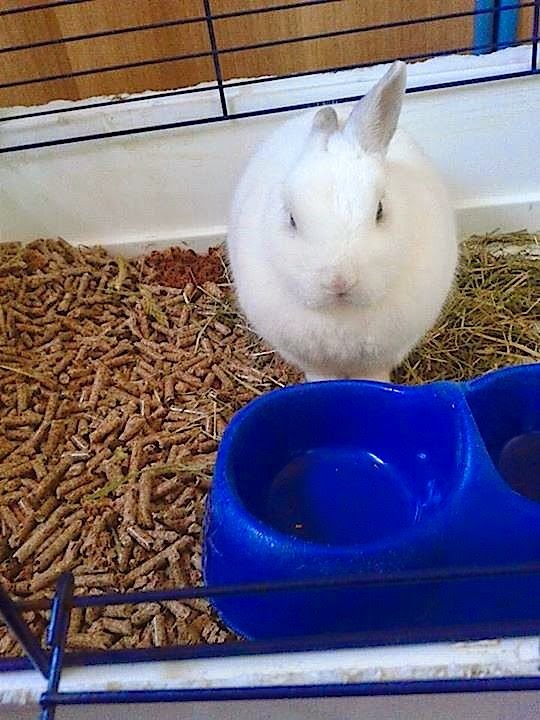 The brightness of the blue bowl makes it all the more obvious that the hoomins have been neglectful of the snowy white bun. Sigh.